I like the look of the chain belts and bras, and they aren't very expensive, but have no idea how to affix the bra cover. Could you explain that, and also what the bra itself should be covered in? Should I put something between my skirt and the belt to help hide the waist line of the skirt? Thank you so much for information on belt pattern making, and alterations! I live in a small, fairly isolated town, and I met my instructor only four months before she moved from the area... but I'm hooked on belly dance! Now I unfortunately have no examples of costumes other than on great sites like this one, and the videos I've bought. I made a go at a sequin belt, but it just doesn't fit right. I'm so happy I know how to fix it without starting completely over! I am so thrilled! Your costumes are gorgeous, and you look wonderful in them. Thank you for sharing your experience and knowledge! If you wish to wear a chain bra over your costume bra, start with an underwire bra that is already covered attractively. You may cover it yourself in almost any fabric that is not too fragile, and it is always easiest to do this with a stretchy fabric that has "give" and doesn't ravel. If covering the bra yourself is too much of a challenge (I could write ten pages on this subject) there are ready made bras you can purchase which look similar. I believe Victoria's Secret makes one covered in velvet. We don't want to see plain old spandex under the chains! Then you can try on the bra and fit the chain or coin bra over it. When it is adjusted properly, (a friend could be helpful here) use safety pins to secure it in place, then use heavy button or beading thread to tack the chain all around the edge, and if it is heavy, at points in the middle as well. Similarly, I would fasten the coin or chain belt at several points through the skirt with tiny safety pins under the fabric, so that it doesn't slide down or twist around as you dance, showing the skirt edge, which can look messy. If the skirt edge is especially bulky or ugly, you could fasten a nice hip scarf over it before adding the chain belt. Thank you for the compliments and the encouragement — it makes me feel all warm and bubbly inside. Someone has noticed my efforts! "I have a suggestion for you. I read the piece about using floss-vs-thread to sew on coins because you have to have 1/4 inch of slack so the coins will jingle. To keep the jingle & lose that ugly 1/4 inch of exposed button thread, use a single round bead. Go through your fabric, then the bead, then the coin, and then back through the bead pulling your thread snug, but not tight. 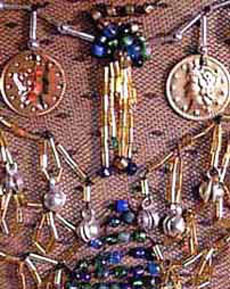 You can use either matching (Example: gold/gold) or contrasting (gold/silver or color/metallic) beads. You can get a lot of variety in your color patterns this way and it's easier to keep the thread length the same. You can get even more variety using multiple beads or bugle beads." 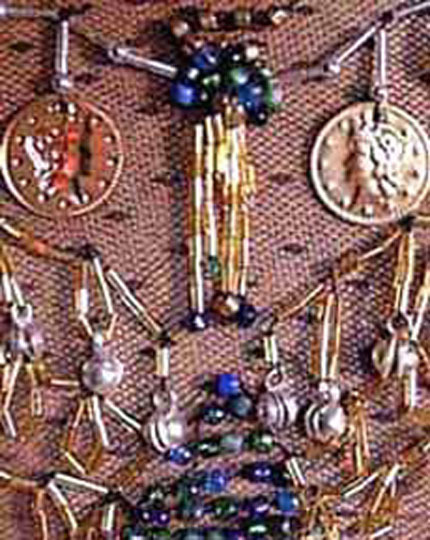 Leslie Yamada provided this photograph to illustrate her bead and coin technique on a stomach cover. This diagram illustrates the technique. Ask The Costume Goddess: Beads Connecting Bra. How can beaded strands be used to connect a bra to a collar?